Don’t you just love the stretchy ribbed bands and cuffs on knitted garments and accessories? I do too, but I can’t knit. So what’s a crocheter to do? How can we achieve something similar in crochet? 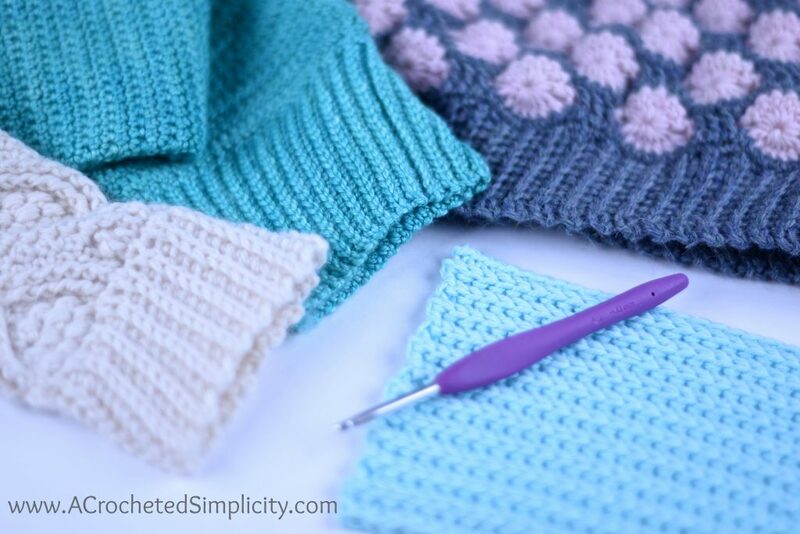 There are a couple of stitch patterns and techniques I use regularly that are my favorites when it comes to adding a stretchy knit-look ribbed band or cuff. In this post, I’ll share a photo and video tutorial for one of them. The hat shown in the upper right corner of the photo above is the Polka Dot Slouch. Click HERE to find the pattern on Ravelry. The mittens shown in the lower left corner of the photo above are the Hourglass Cabled Fingerless Mitts & Mittens. Click HERE to find the pattern on Ravelry. If you’d like to follow along with me in the photos or video below, you’ll need to make yourself a swatch. Choose any yarn you’d like to use and an appropriate size crochet hook. Crochet yourself a a simple tube using any stitch you’d like, just make sure your stitch count is a multiple of 2. I’m just using an old WIP I had on my desk. 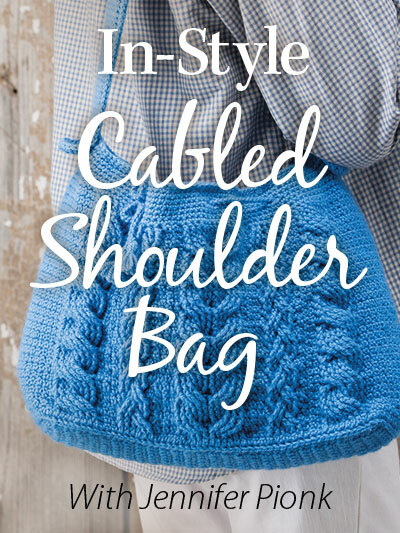 If this is the first time you’ll be working a knit-look ribbed band onto a project, I’d suggest practicing with a contrasting yarn for your ribbing so that you can see your stitches more easily. 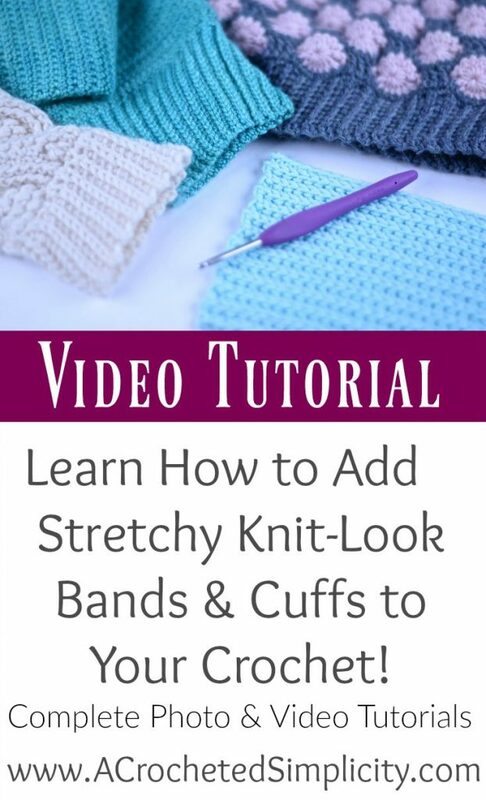 Tip: If you’d like to add a stretchy knit-look ribbed band or cuff that you can fold up/down, read the tip at the end of this tutorial. 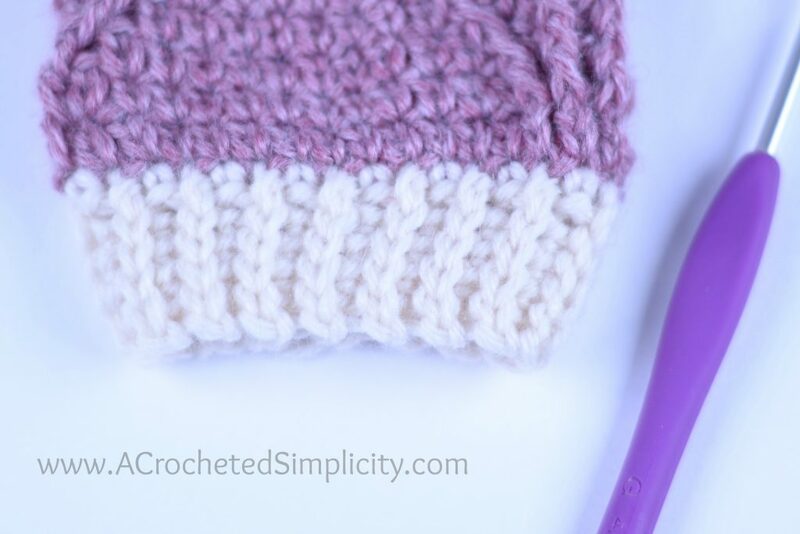 How to Add a Stretchy Knit-Look Ribbed Band / Cuff to your Crochet Projects! After you’ve made yourself a swatch, as instructed above, follow along with me in the photos below! Photo Above Left: Join your yarn with a sl st to any st along the edge of your project. If you’re going to work the band or cuff in the same color yarn as the rest of your project, you will simply continue working from where you left off. Photo Above Center/Right: For the purposes of this tutorial, I’ve chosen to ch 6. Working into the back hump (ridge) of the foundation ch, sc in the 2nd ch from your hook and in each ch across to the last ch. Do not work into the last chain just yet! Photos Above: Now you’re going to work a sc2tog (see special stitches above for stitch definition) in the last ch and the same stitch along the edge of your project as your ch 6. This sc2tog secures your ribbing to your project. (5 sts) *Note: This is the project’s right side. Photo Above Left: Shows the 2nd row completed. Photo Above Center: Ch 1, turn, working into the back loops only, sc in each st across to the last st.
Photo Above Right: sc2tog into the back loop only of the next stitch and the NEXT stitch along the edge of the project (see silver yarn needle). *Note: from here on out you will always work into the next st along the edge of your project. Photo Above Left: Shows the sc2tog complete at the end of Row 3. Photo Above Center: Sl st into the next st along the edge of your project. Photo Above Left: Continue around the edge of your project by repeating the same 2 rows, making sure to end with an odd number row (of sc). Odd Rows (right side): Ch 1, working in the back loops only, sc in each st across to the last st, sc2tog in the last st and next st along the edge of your project. Even Rows: Sl st into the next st along the edge of your project, turn, working in the back loops only, sl st in each st across. Photo Above Center: Now you’re going to seam the ends of your band by doing in the following: Insert your hook from front to back into the front loop only of the first stitch from Row 1. Insert your hook from back to front into the back loop only of the first stitch from the last row. Yarn over, pull thru all loops on your hook. Photo Above: Do you see how the sides of the ribbing are naturally cinched inward? This is normal, and you want this to happen. The stretchy knit-look ribbing is very stretchy and will stretch to fit the intended head size, or arm. Fold Over Band/Cuff: To make a wider band/cuff that will be folded up/down, just simply work Row 1 on the wrong side of your project. When it is folded up/down, the right side of the band/cuff will appear on the right side of your project. « Giveaway – The Tool Every Crocheter Needs! Wow! I love this method and will be using it on the next hat that I make! Thank you for the great explanation, photo and video tutorial.